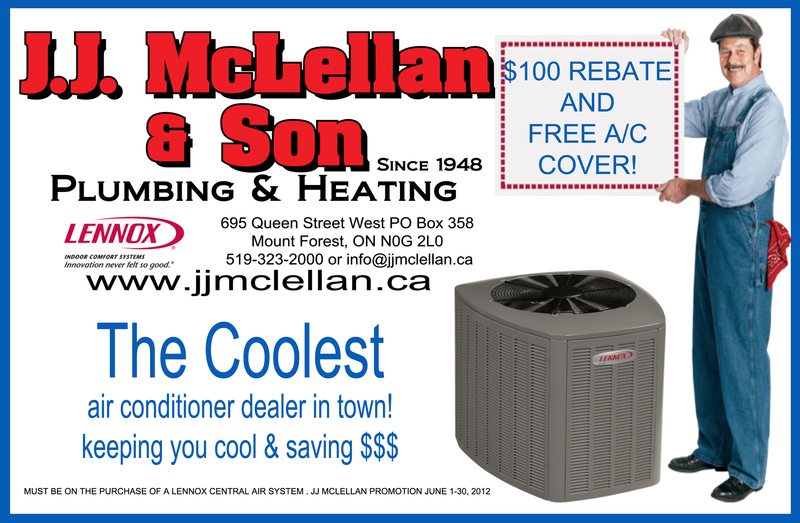 air conditioning | J.J. McLellan & Son "
The HEAT is back! But… your A/C could still freeze up! The heat of the summer is back and in full force! The hydro grid will be feeling the force today with all the air conditioners being turned back on to cool the homes after the fall-like weather we have had. Even with this hot humid weather, your air conditioner can still freeze up! If you only turn on your air conditioner when its very hot out or if your system is dirty. Both can cause the system to run continuous or cycle on and off too quickly and could over work the system which would eventually freeze up or a part could burn out within the furnace. When the air moves over the A-Coil, which is located above the furnace, the A-Coil cools the air with the freon from the condenser. When the system does not get a chance to rest and is continuously running the A-Coil will eventually ice up causing the system to not work properly. This is an A-Coil. The freon runs through the copper tubes. It really does have an A shape! Looking down on the case A-Coil. To avoid the air conditioner system freezing up there are a few suggestions. 1. Keep the temperature in your home set at a consistent temperature all the time. If the home requires cooling, the air conditioner will turn on. 2. If you only use your air conditioner when it gets very hot – begin by setting the thermostat just 2-3 degress less than what the current temperature is in the room. Once the house reaches that temperature, let it sit for 30 min and then lower it again by 2 degrees. By allowing your home to slowly be brought down to a comfortable temperature your equipment has a chance to rest and will avoid freezing up that constant operation can cause. 3. Set a realistic cooling temperature. On very hot humid days, your system will have a very hard time cooling your entire home or business after not being on for a day or more. 4. Ensure your filter is clean! A dirty filter will block air flow causing the system to over work.Filters are not expensive. Buy a few at a time and have them on hand ready to change! 5. Is your heating system clean? If your furnace and air conditioner are dirty this can cause your system to over work. If you are doing all the correct things and its still not working properly, it could be low on freon or there could be a more serious issue. In which case you should call a professional! 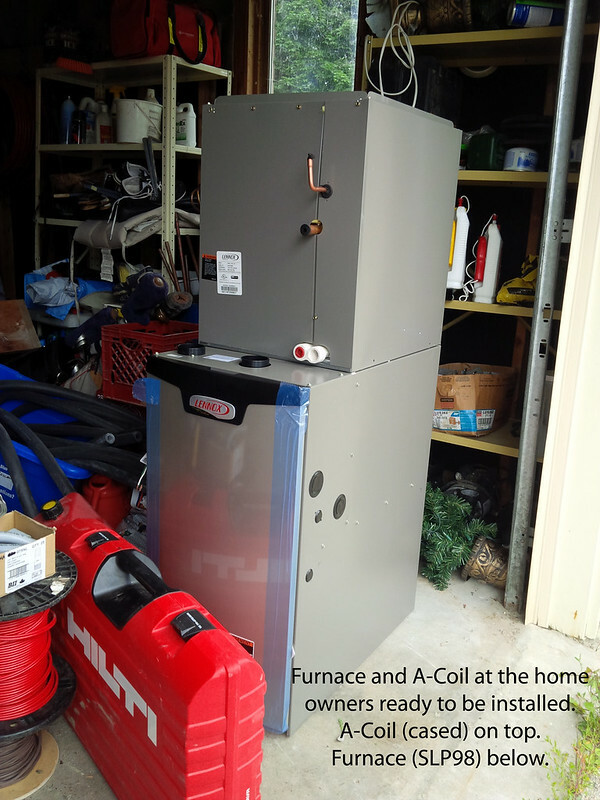 An A-Coil and Furnace ready for installation in a customer’s home. The A-Coil is cased so it comes like this with the coil inside. The front of the case comes off to check or clean. 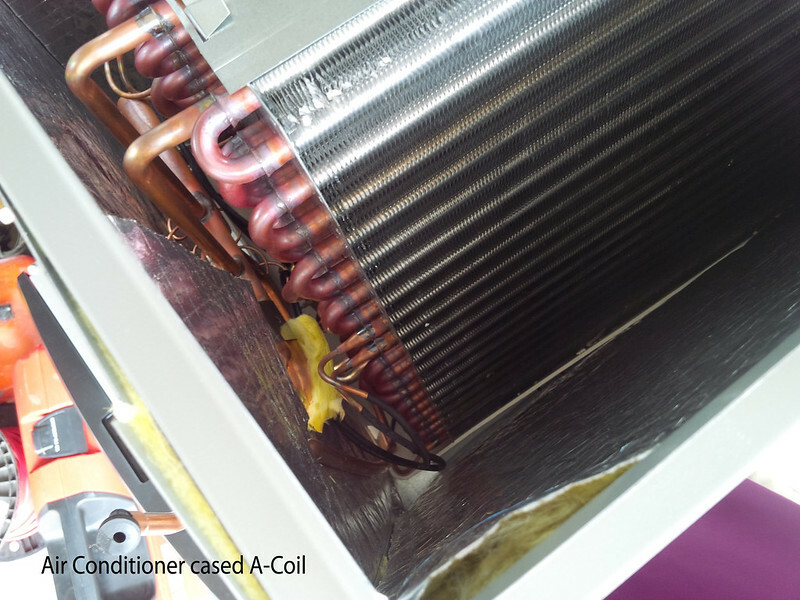 A-Coils which do not come in a case have duct work built around them. A commercial customer was looking for the comfort of central air with the duct less option for a newly renovated office. 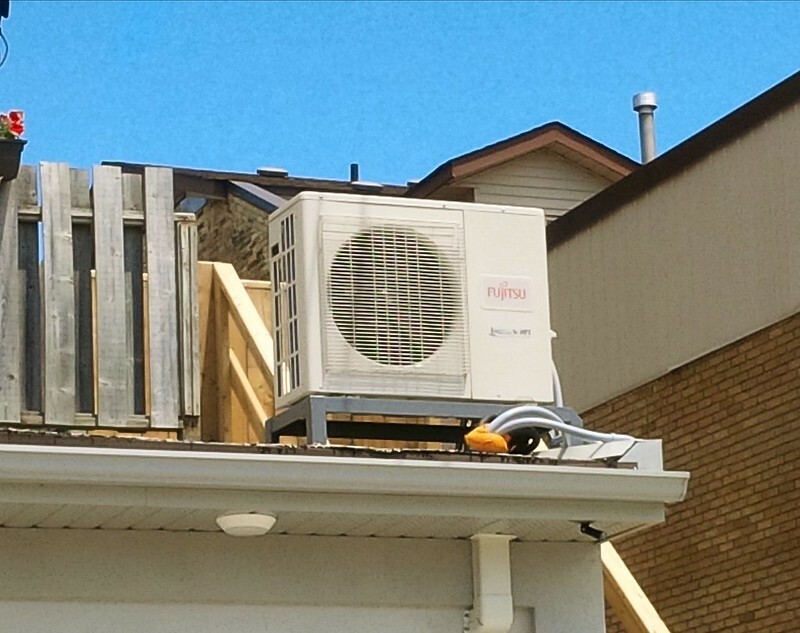 The best of both worlds is a Mini Split Air Conditioning System. 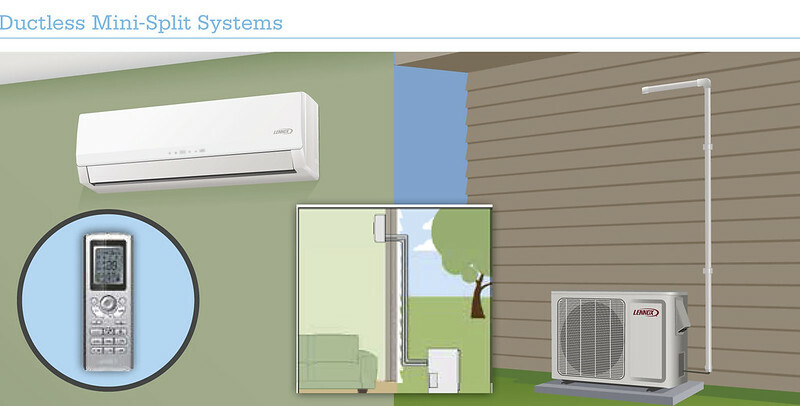 A mini split system is much like central air as there is an outdoor and indoor unit. The difference is the indoor unit is in the room you would like it to cool. Our customer chose to go with the Fujitsu Mini Split System. This particular unit includes this outdoor unit, which was safely mounted to the roof and indoor ceiling cassette’s. The difference between the Fujitsu units and the Lennox units is with the cassette’s Fujisu offer’s. Businesses or homes with t-bar ceiling can simply “drop” these cassette’s in where a ceiling tile would have been. 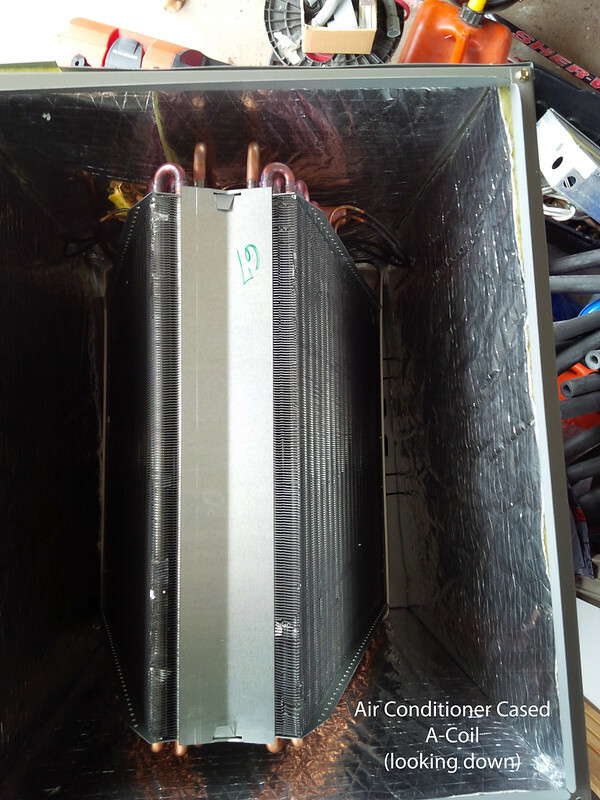 Inverter Technology – now more economical to operate and quieter to run, handle greater extremes in temperature, are smoother and more stable in operation and can reach the desired temperature faster than conventional air conditioners. Swing Louvers – the air flow direction is set automatically to match the operating mode. Slender Fit – this design allows for the cassette’s to be installed with very limited ceiling space. 4 Way Air Flow – Airflow in all directions maintains an even temperature throughout a space – perfect for in a corner or long hallways. Simple Maintenance – There is a detachable and washable air intake grille and filter. Humidity Control – this system features Dry Mode, which helps to control humidity levels even when cooling may not be needed. Features of the Fujitsu Mini Split with Cassette System courtesy of the Fujitsu website. Below is a photo of the outdoor unit for the Fujitsu system we installed. The Lennox Mini Split System is an excellent addition for a home or business without forced air heating (and cooling) and offers a more affordable cost than ceiling cassette’s. If your home, business or shop has infloor heating this would be a great cooling option if you didn’t want to run ducts throughout the house. Also keeping in mind if you do have infloor heating and go with a mini split system for your cooling, we do still recommend having an HRV in your home (which is less ducts than forced air) to ensure you are able to bring fresh air in and remove stale air from the home. Below is the Lennox Mini Split Air Conditioner System. The Lennox unit is recognized by AHRI Certified, HRAI and is Energy Star Approved. Features and Benefits courtesy of the Lennox Residential Website. . Please remember with all HVAC Equipment, regular maintenance is very important for not only the life and proper operating efficiency of the system but also for your health as well to ensure you are breathing clean air! Are you building a new house? Renovating? Time to upgrade your HVAC system? Do your research and save money in the long run! Upgrading your heating and cooling appliances during the building process will cost you more initially, however this will save you money in the long run. Consider all options, not only your building materials and décor but the true “heart” of your home – in the mechanical room. This room controls every aspect of your home from your hot water, your central vacuum, air exchanger, heating, cooling and electrical. Also do not forget future additions… will you one day finish your basement? do you have a gas line run for a fireplace or perhaps you should think of infloor heating? Will you want to have a gas BBQ in your back yard? Will you one day want a gas fireplace in your livingroom? Whether you have the option of natural gas or propane service at your home, we are able to offer you products in your choice of fuel sources, which will still provide you with a variety of energy efficient appliances for your heating, cooling and air quality needs. Why Choose JJ McLellan & Son for your Heating and Cooling mechanical needs – we are reliable, we have been in business for over 60 years – since 1948! We not only install new, we also service and maintain equipment of any age and even make! 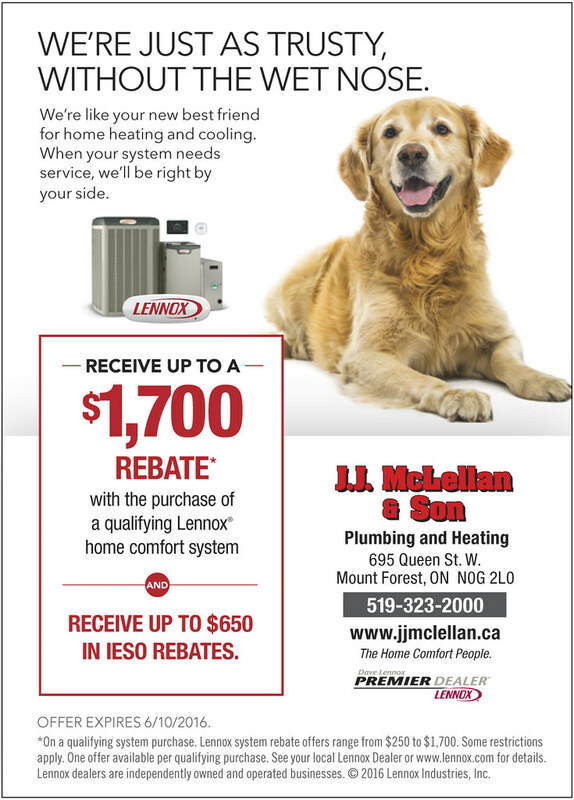 As an Independent Lennox Dealer for over 50 years and your local Lennox Premier Dealer we are able to offer our customers competitive prices, local small town service, affordable financing and complete care warranty (labour and parts) packages for complete peace of mind. We Are The Home Comfort People! Why buy Lennox… when renovating or building a new home many people spend the most money on things people will see – flooring, fixtures, cooking appliances, furniture etc. Yet fail to think of the appliances that will run your home – heating, cooling, air quality. To upgrade during the building or renovation process from “builder standard” equipment to higher quality energy efficient Lennox appliances you will save money and be more comfortable in the long run! Check out the reasons why to choose Lennox for your HVAC needs… And rest assured that not only will Lennox be here years from now should you run into trouble with your system, we will be too! Why Lennox for Your HVAC Needs? There are many reasons to choose Lennox for your heating and cooling needs, starting with our innovative products. Lennox is built on a legacy of innovative firsts, from the introduction of the riveted-steel furnace in 1895 to a solar-assisted home comfort system. Today, the legacy continues with exclusive technologies that deliver the ultimate in quiet, consistent heating and cooling. As an industry leader, we can do what no one else can—deliver the complete range of products needed to assure your total comfort. As a four-time winner of the ENERGY STAR® Manufacturing Partner of the Year award—the first winner in the heating and cooling industry—Lennox offers a complete selection of high-efficiency systems that can save you hundreds of dollars every year on your utility bills. Ene•vations like the SunSource® Home Energy System and SLP98V variable-capacity furnace are part of our commitment to creating innovative products that contribute to a cleaner global environment. We also participate in partnerships that get us closer to this goal. Key among them are thermostat-recycling programs, which facilitate the collection and proper disposal of mercury-containing thermostats. Dropoff sites are located throughout the U.S. and Canada. To find a drop-off site in the U.S., click here; in Canada, click here. Want tips for making your home more energy efficient? Get ideas, guidelines, information and more at ItPaysToLiveSmart.com. Lennox has a longstanding commitment to deliver innovative products that you can count on. That’s why you’ll find the Good Housekeeping Seal on most Lennox® products. As one of the most widely recognized symbols of quality, the Good Housekeeping Seal assures you that the Lennox name is one you can trust. Advanced products like air purifiers and cleaners, working together with a Lennox® heating and cooling system, help reduce concentrations of allergens and other contaminants in the air. They also help improve air circulation and balance humidity levels. And unlike many competitors’ products, these systems clean the air without producing ozone, a known lung irritant. Before our products go into your home, they go through extensive testing in our state-of-the-art research lab. Here, Lennox home comfort systems are tested to meet the challenges of the most demanding operating and environmental conditions. On top of exceptional quality you get when you purchase a Lennox® heating or cooling system, you also have the comfort of knowing it’s backed by one of the best warranties in the business. For select high-efficiency systems, extended warranty protection is available when you register your product online. The Lennox name is known throughout the world for quality home comfort. So when you choose Lennox, you can rest assured knowing you’re getting the very finest in heating, cooling and indoor air quality. You can also trust Lennox dealers—including Dave Lennox Premier Dealers™—to design the right system for your home, install it properly and keep it running perfectly for many years to come. You can also count on Lennox for dependable service. Call us at 1-800-9-LENNOX and talk to a live Customer Care Specialist who can answer your questions. Support is available Monday through Friday, 8 am – 8 pm EST. 24-7 Emergency Service from our company and being around for over 60 years we will be here when you need us – locally owned & operated! Give us a call for your FREE No Obligation Quote! Don’t forget to ask Mike how you can get 10 years complete piece of mind and affordable payments (with legible and easy tl understand “fine” print!). If your hvac system is showing its age, you’ve had your fair share of repairs or see the $’s rising on every utility bill, our Comfort Advisor, Mike Johnson, will schedule an appointment with you to meet at your home to go over all details, your requirements, budget, wants and needs as well as take measurements and pictures. If you are planning a new home build, additions or renovation and have plans, drop us off a copy with details of your requirements, budget, wants and needs and we would be happy to provide you with a free no-obligation quote! We also cover all Plumbing Services as well! From repairs, service to new installation and building! How do I know when to replace my cooling system? With this heat are so very blessed with this summer we are getting a lot of calls inquiring about air conditioning… when a customer should replace their current system or how big of a system they should get new. How do you know when its time to replace? Repairs – if you are having to repair your system each year its time to look at a newer air conditioner. Age – if your air conditioner is over 10-15 years old you could greatly benefit with a new one. Utilities – have you noticed your utilities going up? Have a look at your “older” appliances – this includes your cooling and heating system! Humidity – running your air conditioner will help with humidity in your home during the summer months, if you notice its harder to control it might be time to replace. Give Mike a call at our office 519-323-2000, as our Comfort Advisor he is excellent at sizing up the proper equipment for your home or business to ensure you are getting the most efficient and cost effective system! JJ McLellan & Son is a 4 generation family run business since 1948! We service Mount Forest and all surrounding areas! With very affordable Financing available (with no penalties to make extra payments or pay in full!) and 10 year parts and labour warranty packages available for your peace of mind! Cool down before the summer really heats up! $100 REBATE AND A FREE A/C COVER!!! It is almost heating season! Hard to believe that the summer is coming to an end and fall is fast approaching us. With that comes our FALL PROMOTION for Heating & Air Quality Equipment! We have individual rebate offers as well as system rebate offers. The System Rebate Offers are on an Indoor and Outdoor Units (Furnace and Air Conditioner) and you can also get additional rebates for Healthy Climate & Controls (HRV and Thermostat). The savings really ADD up! Check it out! AND Add total peace of mind to your purchase for your home that you will be completely covered for 10 years with Parts & Labour Warranty as well as very affordable System Financing! Not only will you receive rebates back from Lennox and the ecoENERGYTRetrofit programs you will also breathe easy knowing you have a very efficient system for your home which will be economical to run and keep your air cleaner! It was finally offically annouced that the ecoEnergy Rebates are back! 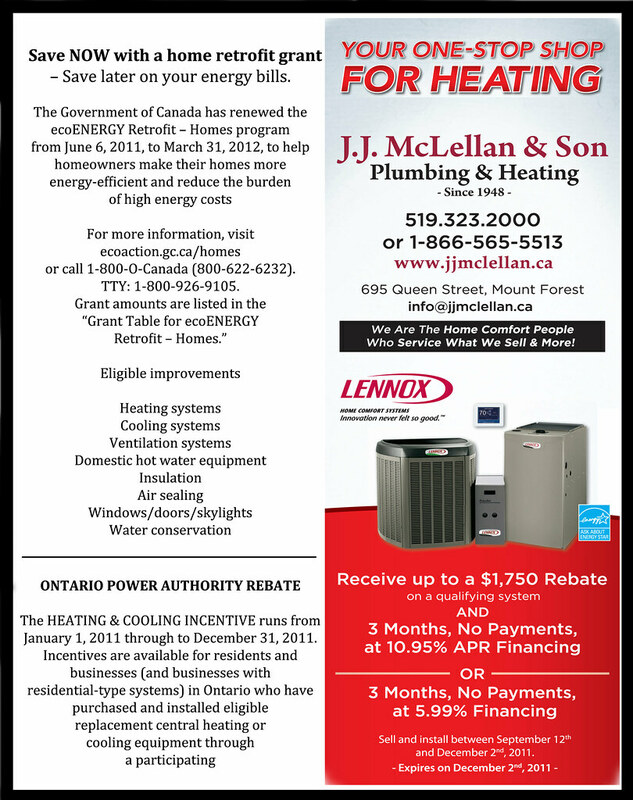 This means more savings for our customers… we are able to a very affordable financing package along with a 10 year labour + parts warranty AND you may now receive rebates back from the government for upgrading your heating and cooling system to something more efficient (saving $ and energy!). This is in effect from June 6, 2011 to March 31, 2012 – you must have a pre-retrofit inspection prior to making any replacements. However you will find that if you are a previous participant you may make more improvements this way. See the information below – which is directlyl from the ecoEnergy website for eligible improvements. Furnace example – a gas furnace or ENERGY STAR qualified oil furnace that has a 94.0 percent AFUE or higher and a brushless DC motor when installing a condensing furnace for the first time. This improvement can obtain a rebate of $790! A/C example – a central split-system A/C that has an AHRI number meeting the requirements. This improvement can obtain a rebate of $250! Ventilation example – Install an HRV or ERV that is certified by the Home Ventilating Institute (HVI) and listed in Section 3 of their product directory. This improvement can obtain a rebate of $375! For doing these improvements to your home you can not only get $1415!!! Thats money BACK in your pocket. If you take advantage of our low cost easy monthly financing you can defer your payments for 3 months*, have a low monthly payment with no penalty for making “un-scheduled” extra payments AND pay the balance off at anytime with no penalty. You can also have the peace of mind of a 10 year warranty on ALL your new equipment which covers you for parts + labour for any repairs in the 10 years! The only thing you have to do is ensure your equipment is serviced each year! Rebate of $1415 + 10 Year Warranty Parts + Labour + Quality Equipment + Company You Can Trust + Low Monthly Payment = PRICELESS! Give us a call for your FREE estimate !